I’d rather go to Hell actually. That’s where all the cool people hang out… and I know the bouncer. 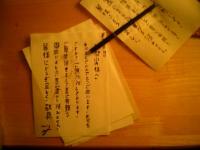 Only one thing harder than writing in Japanese: writing a letter in Japanese! I mean, for all I know, I probably misspelled half the kanjis resulting in my letter addressing yutaka’s parents as “most honorable silaginoids” or something like that… So how could I be worrying about the overall level of politeness of my writing. Are you the human of the country of somewhere? which is awfully nice and flattering, but utterly undeserved (believe me, even 3 year-old Japanese write infinitely better than I do).